Nikki Chauhan, DDS, a Sacramento Invisalign dentist and certified Invisalign provider, has been helping patients improve their smiles with Invisalign since 2005. 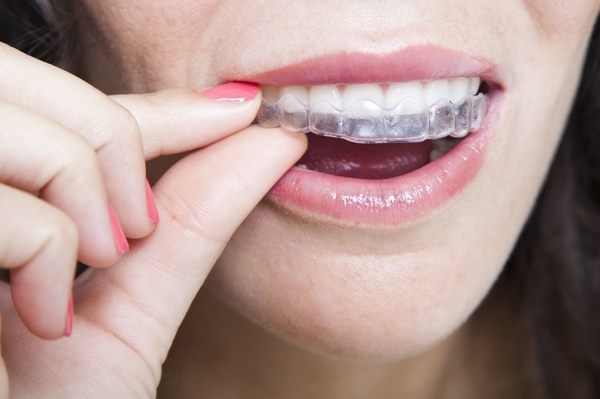 Invisalign is commonly used to correct crooked teeth, crowded teeth, overbites, and underbites. More than merely an aesthetic procedure, Invisalign is also used to align the mouth and teeth. For cosmetic cases, Invisalign can be a conservative approach to help keep the teeth aligned which can make other procedures more conservative in the future. For those with crooked or crowded teeth, Invisalign is helpful not only in producing a more attractive smile, but in maintaining better oral hygiene. Crooked and crowded teeth are harder to clean, which gives them a tendency to decay faster and lose bone more quickly. By fixing those issues, it becomes much easier to keep the teeth cleaner. The clear aligners involved in Invisalign are removable, which means you can eat the foods of your choice without damaging brackets or getting food stuck in wires. Keeping your teeth clean during treatment is also much easier with Invisalign vs. traditional metal braces. 1. Emergencies / urgent / critical care - Treating emergencies and disease conditions comes first to get you, the patient, out of any discomfort..
2. After-emergency care - Some conditions (such as cavities) may be able to wait until emergency care is complete. These are very important as well, but often not emergencies. 3. Specialist referrals - Dr. Chauhan recognizes when her patients are best served by the expertise of a specialist and refers to them if warranted. 4. Aesthetic, less critical - Cosmetic procedures, while important, are fortunately less critical than all of the above. Once everything else has been taken care of, she will recommend Invisalign and other cosmetic treatments as needed or desired to improve aesthetics and give you the smile you have always wanted..
• Schedule a consultation with a Sacramento Invisalign dentist to see if you're a good candidate for this procedure - Dr. Chauhan's comprehensive initial consultation involves not only checking the health of your teeth and gums, but also a thorough head-and-neck exam including your jaw joint, lymph nodes and an oral cancer screening, She will then come up with a distinctive treatment plan based on your goals and needs. From there, Dr. Chauhan works with you to develop a blueprint for all of your further care. • 3D digital impressions - Dr. Chauhan uses 3D digital imaging equipment (Itero) to make a "virtual" impression of your teeth. This means no uncomfortable dental impressions using substances that harden inside your mouth. It also means that Dr. Chauhan can immediately begin planning your Sacramento Invisalign treatment and show you what your finished smile will look like once your treatment is complete. Since you do not need regular adjustments and changing of brackets, you’ll spend less chair time with your Invisalign dentist. You’ll be able to switch out your own aligners about every two weeks. Are you a good candidate for Invisalign in Sacramento? Call our office today to get started.